Murder, She Wrote is rated 4.4 out of 5 by 79. Rated 5 out of 5 by 2008Feb from Loved this game! I purchased this game a couple months ago and had not played it until just recently. It has everything I want in a PC game. It wasn't too difficult, it had plenty of hidden objects, I enjoyed the mini games...was just perfect for me. I hope there will be more of these type games. 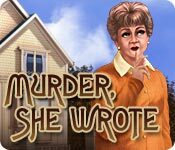 Rated 5 out of 5 by Suelovesgames from Fantastic Game I've not really watched the television series 'Murder, She Wrote' with Angela Lansbury as Jessica Fletcher but I'm thinking that I might dig out the epsiodes now. There are five stories to play in this game. I thought the first one was the whole game. They last at least half an hour and they are intricate, complex murder mystery stories played out beautifully with lots of good pacing, minimal animation and lashings of suspense. I never figured out who had done it. There were so many twists and turns. One time there was one suspect I thought who had definately done it and the next minute I thought it might be someone else. Great storytelling, dialogue and narration. Great characters too. 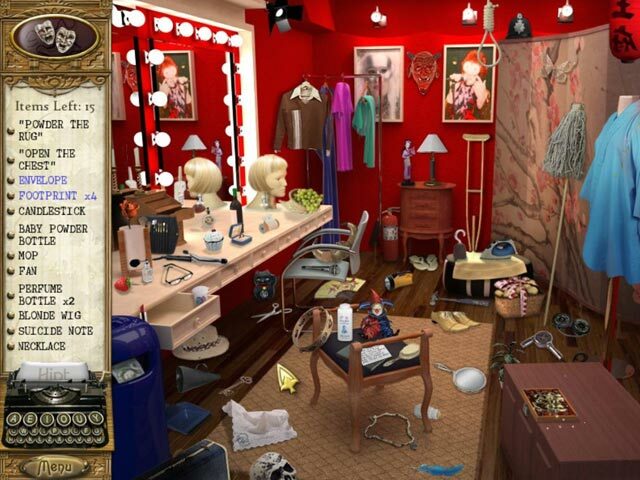 This is a straight forward hidden object game, old school. There are five letters to find (typewriter keys) in each scene, usually vowels, which will fill in the gaps in the words, in the object list. The objects are not too easy and not too hard to find. It's a very cosy game, relaxing and interesting at the same time. It's a HOG with the added bonus of watching five really gripping murder mysteries. Rated 5 out of 5 by Godlover24 from What a great game!!! Wow! I have loved the show since i first saw it. The game was just like the show! It had 5 wonderful mysteries and They were somewhat hard to solve. I cannot wait to play Murder, She Wrote 2 return to Cabot Cove! 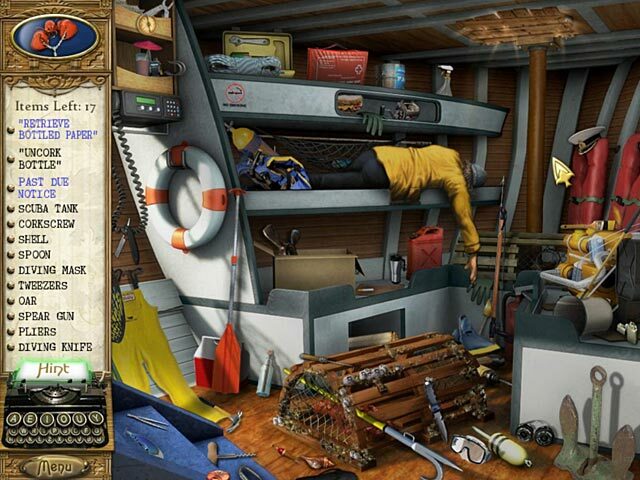 Rated 5 out of 5 by Rambo44 from A Great Hidden Objects Game This game reminds me of the show. I used to watch this show years ago when it first came out. I really enjoyed playing this game. Way to go Big Fish Games. Rated 5 out of 5 by billh3 from Favorite HOG so far! Loved this game, did NOT like Return to Cabot Part2. Part 2 has an inventory and you are trying to figure out what to find where and where to use it.....detracts from the basic HOG fun. Highly recommend this first game...want MORE just like it PLEASE!! Rated 5 out of 5 by AdrianaIP from Yay!!!! Jessica Fletcher is back!!!! If you miss "Murder she wrote" here is the next best thing. Five new cases for our sleuth. Five nice mysteries that keep you guessing till the end. Just HOS and minigames, but with a plot tying it all together. Unlike other games that take a TV show name and then do their own thing, this one is done by someone who has watched it, loves it, and recreates it. Five tidy mysteries. What more could you want? Rated 5 out of 5 by KarenMora from Hidden Object and lots of other interesting puzzles Good hidden objects - not too hard, but not always easy! Good storyline, just like the tv show. The other puzzles were sometimes a challenge, but always interesting and fun. Rated 5 out of 5 by JustTheFacts from First Class HOG BASED ON COMPLETED GAME FIRST IMPRESSIONS Like its heroine, and no doubt many of its fans, this game is “of mature years”. Its look and style of gameplay is considered dated now, but it still has exceptional production values, and good old fashioned class. SIGHTS & SOUNDS The graphics are quite extraordinary for their time. They are still clear and bright and highly visible even on my large widescreen. It does not of course have a wide screen option, but plays with the dreaded black bars on the side. The drawing hints at cartoony, and there are no great cut scenes or videos. Some of the hidden objects are a little small. If you can live with that, it’s quite a pleasant game visually. The voiceovers are extremely well done. It is obvious they are professionals. The music is from the show, which I don’t happen to like, but is all about faithfully recreating the adventures of Jessica Fletcher. This is not the sort of game where you can expect to get fully immersed, but the atmosphere is indeed very “Maine” to me (to the extent I can know such a thing) . WHAT’S HAPPENING? The game gives you 5 individual cases to solve. Finishing one unlocks the next. In each, we are in Cabot Cove, Maine, and become embroiled in mysteries that occur in the area. In the first, Jessica stumbles across the body of an acquaintance after coming into town to buy lobsters. Mort the Police Chief allows her to assist in the case. GAMEPLAY This is a strictly Hidden Object Game. There is no adventure component whatsoever and only a few easy but interesting puzzles. The HOP scenes are the typically outdated full-room shots and cluttered, they are not overwhelming junk piles. There is a (long) word list of items to find in a panel to the left of the screen, but with a difference. There are no vowels in the words. This unique feature really makes this game for me. In the HOP scene are the typewriter keys for the vowels. You must find them in order to see the words completely. While you’re there, you can also pick up a typewriter ribbon and refill your hint meter immediately (unlike most games of this era, you have unlimited hints). Included in the list of items will be ones in blue which require extra actions, and others in inverted commas (“ ”), that describe an action you must complete using other items on the list. Each scene contains pieces of evidence that advance the story and at least one puzzle. These tend to be relatively simple logic puzzles, and piece together the torn notes kind of puzzles. There is a notebook that keeps track of the story, but not the clues, and a map that is your means of transport. You can play either timed or relaxed mode. Each scene also involves a lot of talking. In fact, there is at least as much time spent listening to the police chief and Jessica questioning people and discussing evidence as there is gameplay. But it is very much the kind of game where you are being told a story, and the gameplay is simply a way of advancing the tale. COMBINED IMPACT This is a high quality HOG, but you must be into the story and/or the show to really appreciate it. Rated 5 out of 5 by bsnbsn from Loved the show and loved the game. 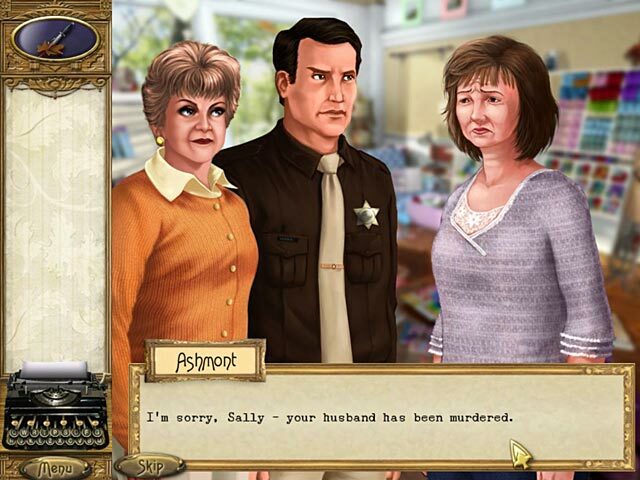 If you are a Murder She Wrote fan you will totally enjoy this game, Five stores--five fun games. Play with or without a timer. You can try to figure out the killer before Jessica gives you the answer. I have also purchased game two. If you are unfamiliar with the TV show, it is still an enjoyable purchase for just plain fun. By the way, the stategy guide is not necessary.